Have an Anesthesia Related Injury in NJ? The use of anesthesia has become commonplace in surgery and other medical procedures, yet it is still fraught with danger. Some types of anesthesia are so powerful that even the slightest error in dosage, or failure to consider a patient’s allergies, can result in severe complications including seizures, paralysis, heart problems, and in the most tragic of cases, wrongful death. When anesthesiologists, surgeons, hospitals, emergency rooms, and other responsible parties are negligent in their administration of anesthesia, the physical and psychological trauma of the experience can be emotionally, if not physically, paralyzing. However, an experienced group of medical malpractice attorneys can stand in the gap, fighting to ensure that you and those you love are thoroughly compensated for the pain you have suffered. The skilled New Jersey medical malpractice attorneys at Fronzuto Law Group understand that when it comes to complex medical and legal considerations involved with anesthesia error cases, there is no substitute for experience. When bringing a claim, our legal team works with seasoned experts, researching every facet of your case to determine negligence, prepare for trial, and zealously advocate for your interests. At the negotiating table and in the courtroom, we refuse to back down until we achieve the most generous financial award available for you and your family. Our extensive record of successful verdicts and settlements illustrates our commitment to excellence and yet, we are equally as proud of our accessible and compassionate approach to client service. Contact our offices anytime at 973-435-4551 or toll-free at 888-409-0816 to speak with one of our knowledgeable lawyers. We will work with you to learn your goals and ensure that you thoroughly understand all of your legal options. Anesthesia is administered during surgical procedures for a variety of reasons: to ensure that the patient does not suffer any pain during surgery, to render the patient unconscious, and to control the patient’s breathing, blood pressure, and heart rate during surgery. Anesthesia can be used for a wide range of purposes and procedures, but its primary functions can be consolidated into the following: relaxing you, preventing you from feeling pain, rendering you unconscious, and/or making you sleepy or forgetful. There are a number of different forms of anesthesia, each of which can be administered in a different way to serve a specific purpose. 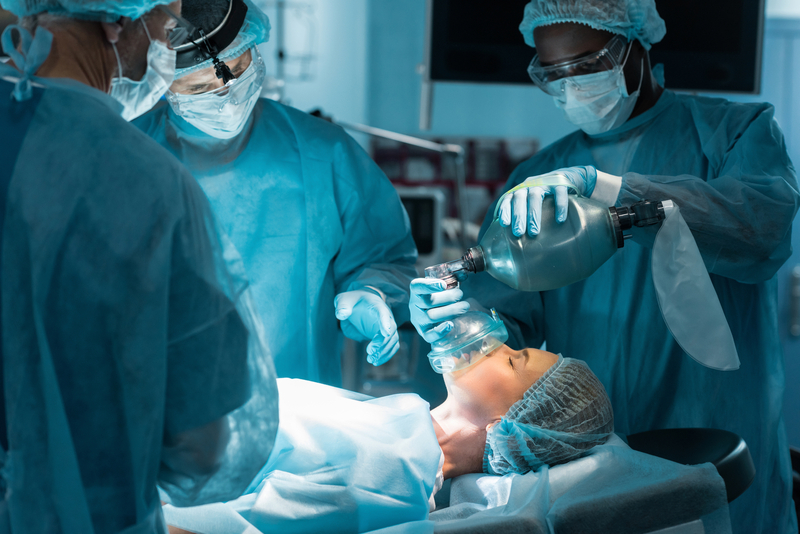 Depending on the nature of the surgery being performed and the health of the patient, a certain type of anesthesia may be used in a given case. The primary types of anesthesia administered during surgery include local anesthesia, regional anesthesia, and general anesthesia. Each type is explained in greater detail below. This type of anesthesia numbs a specific part of the body so that the doctor can perform surgery without the patient feeling pain. Common examples would be minor surgery on a particular part of the patient’s extremities, such as the hand, foot, or shoulder. Local anesthesia is typically administered with a shot. Regional anesthesia can be used to prevent you from experiencing pain in a larger portion of your body and/or used to relax you or put you to sleep. This type of anesthesia can be administered in a shot to a specific nerve or group of nerves (peripheral nerve blocks), or can be administered in the vicinity of the spinal cord to affect an entire region of the body (epidural or spinal anesthesia). Essentially, regional anesthesia helps to numb the patient in a larger area of nerves in the body in order to perform a more complicated surgical procedure. An example of surgery that may require the administration of regional anesthesia is a C-section during labor and delivery. Sometimes, regional anesthesia is administering to a specific nerve in the body; other times, it is administered near the spinal cord through an epidural needle. This is the type of anesthesia that one typically associated with “knocking out” the patient. General anesthesia places the patient’s entire body into a deep sleep so that they will be unconscious during the surgery and not feel any pain. The most serious surgical procedures may require the use of general anesthesia. This type of anesthesia is administered intravenously or through the use of an inhalation device. When Can I File a Lawsuit for Anesthesia Malpractice? Anesthesiologists should be held responsible for errors that occur when they violate professional standards. You may be able to file an anesthesia error lawsuit if you were a victim of negligence related to anesthesia use in the operating room. First, however, it is important to understand the duties of an anesthesiologist. Anesthesiologists are specially licensed medical professionals who are tasked with ensuring that the medication is safely administered. Anesthesiologists are also supposed to monitor the patient’s vital signs and make sure that the patient is stable during the surgical procedure. Additionally, prior to performing surgery, doctors and anesthesiologists should take a close look at records detailing your medical history, including any prior surgeries, past allergic reactions, and current medications. When determining the appropriate type of anesthesia to use for your procedure, or if anesthesia is safe for you as a patient, medical professionals are expected to evaluate your current health and medical history, allergies or past allergic reactions, medications that you are currently taking, the type of procedure or surgery being performed, and the results of any recent tests such as blood tests, EKG’s, etc. Administering too much anesthesia: This can result in a reduced heart rate and cause significant damage to the brain and the central nervous system. In the worst cases, an anesthesia overdose can result in heart attack, stroke, or death. Failing to administer enough anesthesia: This can leave the patient in excruciating pain when they awake during the surgery and can lead to severe health problems such as heart attack. Delay in administering anesthesia: If the anesthesiologist waits too long to administer anesthesia to the patient, it may be ineffective during surgery. Administering the wrong type of anesthesia: This is a particular problem when the patient is allergic to certain medications or anesthetic drugs. Failing to ensure that anesthesia does not interact with other prescription drugs: Depending on the patient’s allergies, mixtures of anesthetic drugs with certain other prescription drugs that the patient is already taking could have deadly consequences. Failing to inform the patient of eating restrictions before surgery: It is imperative that the anesthesiologist provide the patient with sufficient instructions before surgery. Additionally, informed consent is generally required for risk medical procedures that involve anesthesia. Not providing the patient with sufficient oxygen during surgery: For example, when the anesthesiologist fails to adequately intubate the patient, the airway could shut close and the lack of oxygen could result in traumatic brain injury. Failing to properly monitor the patient’s vital signs during surgery: While the patient is under anesthesia, they are incredibly vulnerable and susceptible to serious injury or illness. That’s why the anesthesiologist take care to constantly monitor the patient for signs of distress. Use of defective equipment during sedation of the patient: Sometimes, the ability to properly administer anesthesia is made difficult or even impossible by faulty medical equipment. Depending on the type of anesthesia error, you or your loved one may have suffered severe physical injuries, such as heart attack, stroke, traumatic brain injury, spinal cord damage, nerve damage, collapsed lung, paralysis, or coma. Every year, patients undergoing surgery at U.S. hospitals die due to anesthesia errors. Many of these deaths are the result of medical malpractice and could have been preventable if the anesthesiologists had exercised proper care. If an anesthesia error resulted in the injury or wrongful death of you or someone you love in New Jersey, you may be able to seek financial compensation by filing a medical malpractice claim. The experienced NJ medical malpractice attorneys at Fronzuto Law Group can examine your case to determine if anesthesiological negligence occurred and if so, we work at no cost unless we obtain you a recovery. Contact our local offices in Passaic County at 973-435-4551 to discuss your case. Consultations are free of charge and we are always pleased to answer your questions.